I was SO excited to make this quilt for one of my best friends! 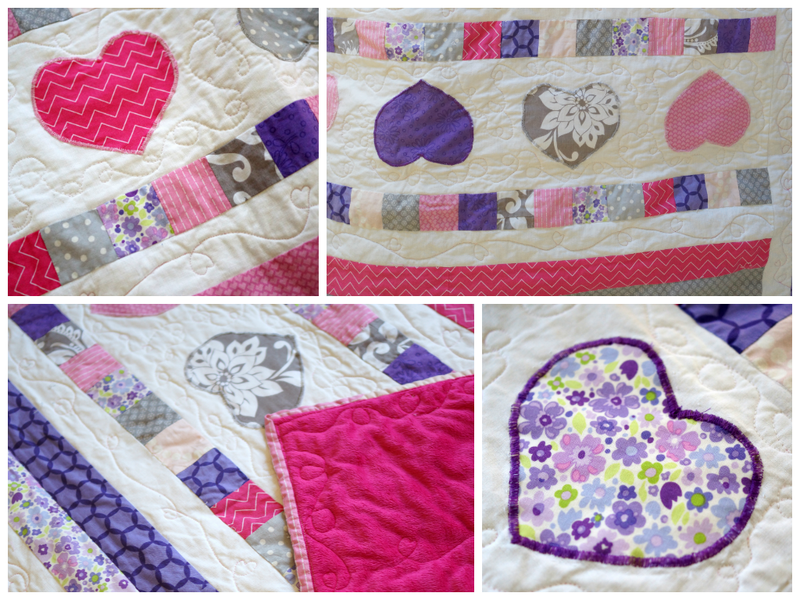 She picked the color scheme for the quilt; pinks, purples, and grays. Immediately, I knew I wanted to make appliqued hearts, since she's due in February. I started out with white strips to use as a border around my fun fabrics I picked out. I cut out a big strip of white for my hearts to go on, and I sewed my strip squares along the top and bottom. I sewed these on before the hearts because I used the squares to help me place the hearts evenly along the white strip. With this quilt I only did one straight line of quilting, which was down the middle to anchor everything in place. I then decided to try out a heart pattern that I drew during church one day. I wanted the hearts to go both directions (right side-up and upside down) so I figured out how to do that while keeping them connected. I practiced a lot on paper, just to get the rhythm. I also drew them on the quilt, just as a guide, and went for it. They are most definitely not perfect, but I had so much fun making them! You can see on these pictures that wasn't able to follow my guide very well, but I didn't let that deter me! I just kept going, making the hearts different shapes and sizes on my white border pieces. Around my hearts I decided to do a simple swirl pattern. Then for the border of the entire quilt I did a combination of hearts with the swirl to tie both patterns in. o impatient to sit down, draw everything out, and do the math!! I just go for it and hope things work out. Which probably isn't the smartest way to quilt... Does anyone else out there do that too? Or do most people use patterns when they quilt?